Columns has been essential part of erecting a building for years. Looking at the old architecture of Egyptians, Persians, and Greeks; arches and columns were necessary to span large distances when creating grand buildings. Though structural in function, columns are now viewed as a work of art. We see all kinds of motifs carved into columns to distract from the bulky look. In some cases like cathedrals, the columns has to be enormous to handle the heavy load of the ceiling, but the decoration should enhance the overall grandeur of the project. In the modern age of architecture, hand chiseled stone or hand carved wood have been replaced with stronger and more practical concrete and steel columns. But, we still need to decorate and enhance the structure with decoration. Foam columns do just that. In today’s construction, we can make foam columns in one or two pieces to go around steel columns or wood post. The advantage, and beauty is limitless. We can replicate any type of column, sleek and modern, fluted, roped and fanciful. We are not only able to make old fashion column design, but also open a door of opportunity to design something that wasn’t possible before. Foam columns are a lot lighter, and easy to install, and can be made to any height and diameter. Most people think that by using foam column, we expose the liability of damaging at the lower part, but different weights of foam and strength of coatings lend added strength. Like anything else in construction industry: done properly, it can last forever. Decorative moldings have been around for a long time. The human desire to create beauty in their environment has led to some magnificent architectural discoveries. Craftsmen were limited to stone, concrete, and wood to make moldings but until recently, through innovation and technology, foam was brought into the mix. The concept of foam molding started when Europeans began using foam panels on their exterior, which is known as Exterior Insulated Foam System (EIFS). 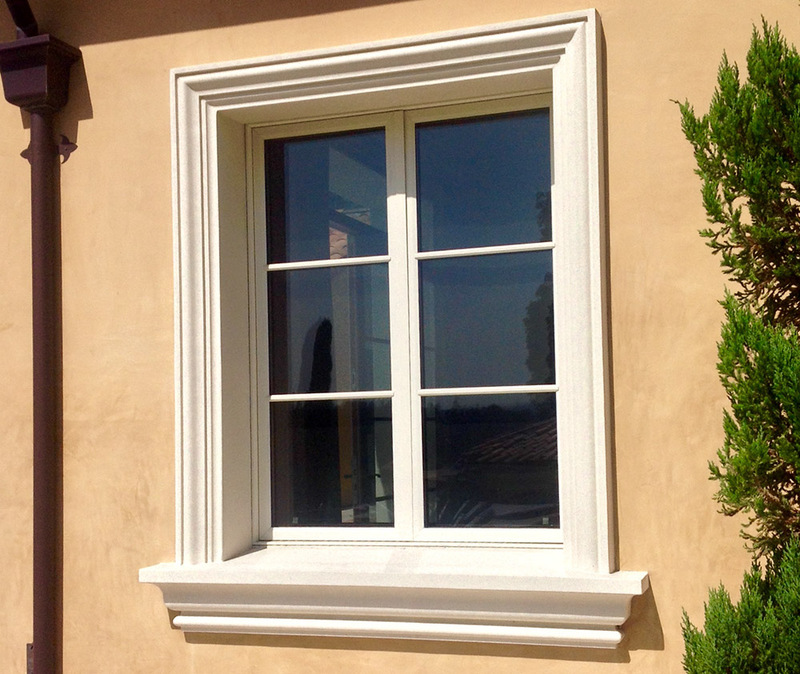 When they were replacing old-fashioned stucco systems with foam, they realized they could create a decorative trim or molding around the window as well. Little by little, this concept grew, and we have replaced stone, concrete, and wood molding with foam molding. Foam molding is not limited to palaces and big buildings, rather, it is an affordable alternative that can be used in any residence for a stylish look. Foam moldings come in different densities for additional strength and sturdiness, making any shape or architectural feature possible at low levels as well as up high. Foam can also be coated in a variety of textures and colors. product exceeds many other materials. Finish carpenters are one of the most valuable tradesmen in building a house. They are usually loaded with varieties of tools to install trims around the doors, windows, and crown moldings at the ceilings. They are very skillful and handy. This trade still exists in big demands, but they are still limited to small sizes. With foam trim, you can come out with your own unique design, and the sizes are limitless. With the newer foam technology, we easily can replace some of the wood trims to foam. Foam trim doesn’t crack, and is low maintenance. Unlike wood, it won’t warp, and does not require painting as often as wood. We are also able to duplicate wood texture for customers who want to imitate the structural element of wood cross beams, with an identical faux paint finish. Instead of a pressed, molded MDF product that is susceptible to moisture, and does not fulfill the same aesthetic as out faux products. The end result is pleasing, and allow us to bring more than one texture to the interior. Although, foam trim is still considered fairly new to the building industry, architects and builders have created beautiful works of art by simply using foam trim. There is a great future for using foam trim in building industry. After all, foam trim are more friendly to our environment, and leave smaller carbon foot print for generations to come. Architectural foam should be created with the same care and artisanal integrity used by the original craftsmen working with stone or wood. Architectural foam changed how we do any facade today. In this fairly new industry, foam brought a lot of advantages to the longevity of a building as well. The high cost of old materials combined with high maintenance, is the reason most homes and buildings became less detailed and less interesting. While pre-cast concrete seemed a viable solution to stone in many applications, it is not a feasible choice in some applications because of its weight and difficult installation. Architectural foam is light weight, installed with a little backing or none at all. Architectural foam can create varieties of architectural details and in most cases, can be customized on the spot for a “perfect fit”. In tall buildings, the dramatic look created by a big shape can only be achieved by architectural foam.